While I was in the University Health Center for some routine blood work yesterday, I learned something interesting. Many of the children she sees as early as 5 years old are developing non-alcoholic fatty liver disease (NAFLD). Either we have some seriously negligent parents who are letting their kids start swigging vodka right after they get off breast milk, or little kids are eating way too much sugar! 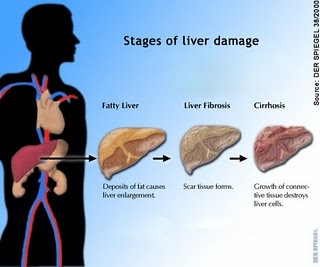 Non-alcoholic fatty liver disease occurs when the liver is overloaded with more sugar than it can process. When this happens, the process of de novo lipogenesis starts - the conversion of carbohydrates in to "new fat", also known as triglycerides. As you may be aware, elevated triglycerides are not a good sign, and when this chronically happens at the liver, it can lead to hepatic cirrhosis (scarring of the liver). Cut the soda, fruit juice, candy, and sugar out of your diet to live longer. Wow! this is a very serious issue! Quite honestly I don't think very many people know about NAFLD. Before reading your post I had no idea of the severe effects of sugar on the liver. I was wondering, just for comparison, what the range would be for elevated triglycerides for a child who has NAFLD, a child who is at risk for NAFLD, and the range for a healthy child? Also, other than decreasing the amount of sugar consumed, is diet the main way to control this or would exercise play an essential role as well? Good question on the triglyceride ranges- I'm not sure how much data has been collected on the triglyceride numbers but I'll look in to it, I'm sure they are practically off the charts. As far as controlling NAFLD, it looks like diet is about 95% of this issue. You could potentially try to out-exercise the fructose intake to prevent weight gain, but the liver still has to process all the fructose that enters the body and it would be really difficult for a child. Don't forget that those who have NAFLD are not "normal" in that their disease causes a variety of metabolic alterations. In other words, sugar in people without disease does not have the effects it would have in people with NAFLD. People with NAFLD are certainly going to have altered metabolisms which further the damaging effects of sugars. But research suggests that excessive sugar (particularly fructose) intake is a causative factor in developing NAFLD, not only a problem for people that have it. J. Nutr., Aug 2008; 138: 1452 - 1455. Diabetes, Jul 2005; 54: 1907 - 1913. Am J Physiol Endocrinol Metab, May 2002; 282: E1180 - E1190. Hypertension. 2005 May;45(5):1012-8. Epub 2005 Apr 11. Fructose-induced fatty liver disease: hepatic effects of blood pressure and plasma triglyceride reduction. So may I presume that in addition to fructose, the "sugar" culprit you are referring to is sucrose or can the monosaccharide glucose and the disaccharides lactose and maltose also be implicated? Absolutely. Fructose must be processed by the liver before it can be used, which makes it the most problematic. You are correct in presuming that other sugars contribute to the same problem, they are not quite as bad though. Sometimes when people ask me about which sugar is worse, I reply with a question: Is burning yourself with 220 degree water worse than burning yourself with 215 degree water? Yeah, a little bit but you get burned either way. Sugar is the same way. I was not aware of this disease before reading this. I only thought that excessive amounts of sugar led to diabetes, but this takes it to another level. The studies done on NAFLD are evidence that the importance of starting a healthy diet from a young age is more crucial to health than most people are aware of.